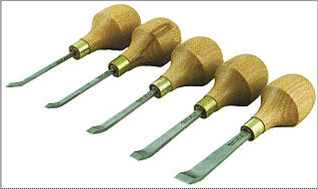 These tools are the same as the newly introduced Single Angle Dog-Leg Chisels but in the smaller Blockcutter form. They are a delight to hold and use. Available in 5 sizes from 1/16" to 3/8" (1.5 to 9 mm).